Will You Be Ready For The Flu? 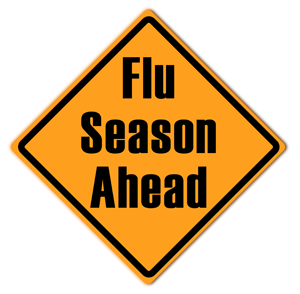 It’s that time again: Kids back in school, weather getting a bit cooler, and folks thinking about flu vaccinations. The CDC recommends that everyone six months and older be vaccinated. Flu strains change from year to year, so there is always a tricky dance between the flu strains that are out there in other parts of the world, our ability to predict which ones will predominate in the northern hemisphere this winter, and the manufacturers producing the right amount of vaccine. This year flu vaccines are in good supply. However, the protection requires one to be vaccinated! Flu vaccines now come in different “flavors” – some are higher dose and intended for seniors, some contain three strains (trivalent) and some four strains (quadravalent). With the exception of the nasal version which is offered to children, none of them contain a live virus; so contrary to popular lore, they are incapable of giving one the flu. The senior or high dose flu vaccine is entering its fifth year of widespread availability. Knowing that those over 65 don’t always get the protection expected from flu shots, this version contains four times the amount of “antigen” which is what stimulates the immune system to gear up for a possible encounter with a flu virus. The senior version only comes in a trivalent form and is preservative free. For adults younger than 65, we have our supply of standard dose quadravalent vaccine. The quadravalent vaccine helps to protect against four strains of flu. We recommend getting your vaccine at the time of a regularly scheduled appointment such as your 3 month diabetes checkup or physical. Others are welcome to walk in during regular office hours. We are not anticipating any shortages of vaccine this year. We spend over 60,000 dollars a year stockpiling vaccines for our patients. Please keep that in mind before you roll up your sleeve at the supermarket. Getting your vaccines here ensures that we have an accurate record of vaccines given to you and remember – if you don’t feel well will the pharmacist be there to take care of you? Know someone who is looking for a great primary care practice? We are accepting new patients.